I often get asked where are the best places for brunch in Vancouver. Each and every time, I draw a blank. Yah, go figure right... That shouldn't be the case as there are many choices for breakfast and brunch in the city. But with the emphasis on "best", it gets a bit dicey. Sure, we can list off the obvious places such as The Red Wagon and Cafe Medina. However, what about something really different? Well, Miss Y and I were invited to try out Calabash and their tropical Caribbean brunch menu. 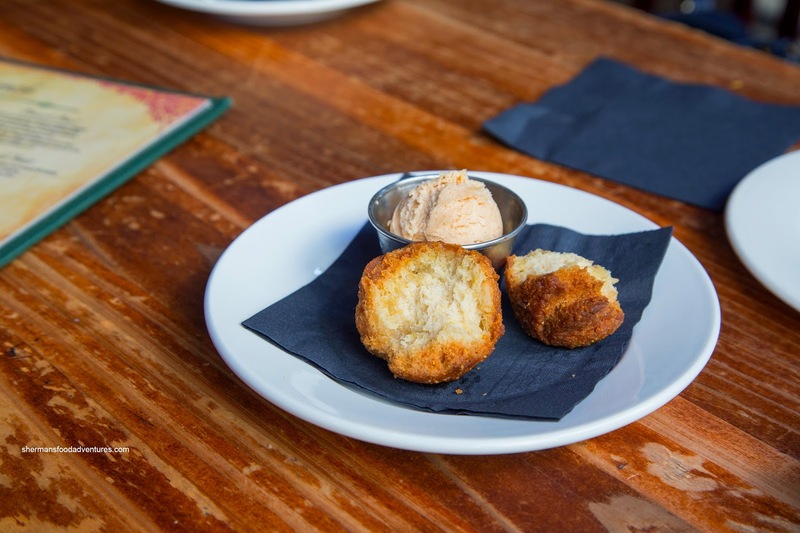 We were started off with their Coconut Dumplings (like fritters) which were similar to the Reef's Johnny Cakes except with the aromatics of coconut. These crispy and fluffy nuggets were further enhanced by the side of mango butter which afforded a tropical sweetness. Furthermore, the background tartness helped lighten up the heaviness of both the fritter and butter. 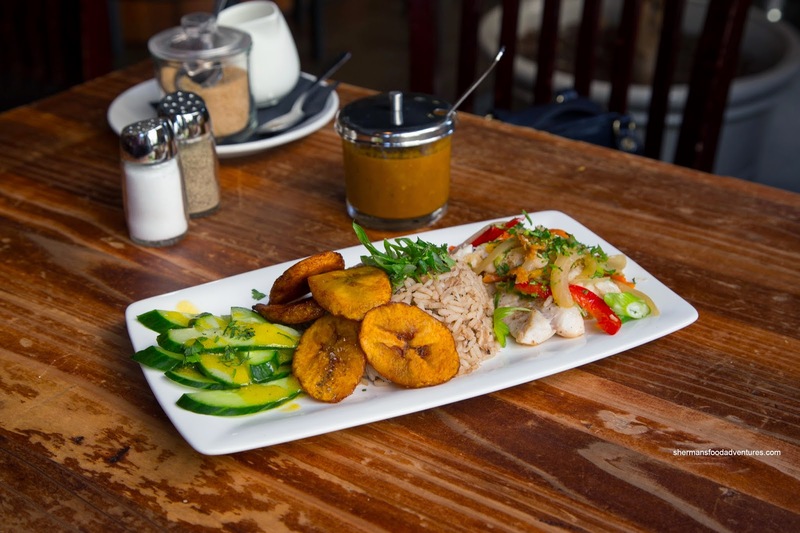 Our first dish was the Escovitch Fish which was pan-seared and served with fried plantain, fresh cucumber and rice & peas. We found the fish flaky and moist. The tangy escovitch sauce added acidity while a dollop of mango hot sauce livened up the flavours. Slightly crisp, the fried plantains were sweet and soft on the inside. 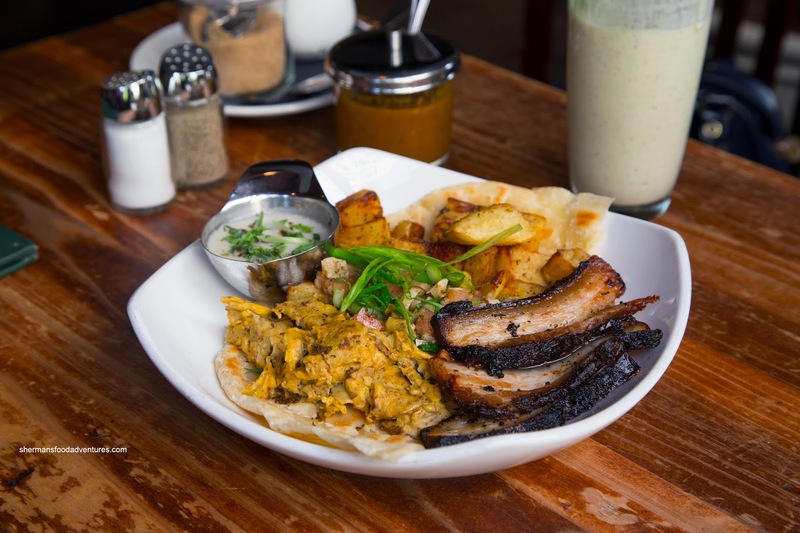 Next, we had the Rise & Shine Roti consisting of jerk scrambled free-range eggs, roasted cumin potatoes, tomato and garlic choka, jerk pork belly and coconut rundown Hollandaise. Atop the flaky & crispy roti, the scrambled eggs were slightly too done for our tastes, but the jerk spices were apparent. We liked the spicy bark on the fatty and meaty pork belly. As for the Hollandaise, it was plenty creamy with a strong coconut milk presence. 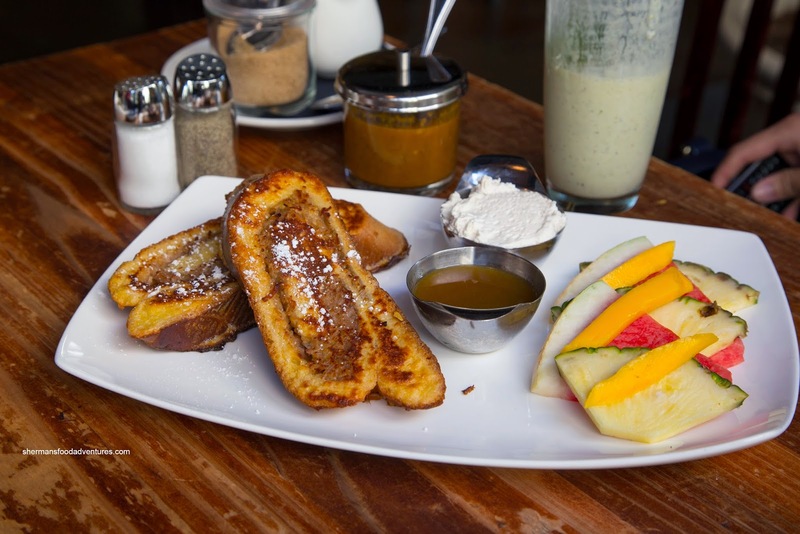 Onto the sweet item of the meal, we sampled the Salara French Toast made with fresh baked Guyanese coconut bread accompanied by spiced mango maple syrup, banana cream and fresh fruit. For us, the bread reminded us of Chinese Gai Mei Bao (which is a good thing). However, with a considerable amount of coconut, there was no mistaking the main ingredient in terms of texture and taste. With the addition of fragrant banana cream and the sweet tropical syrup, this was certainly something different. 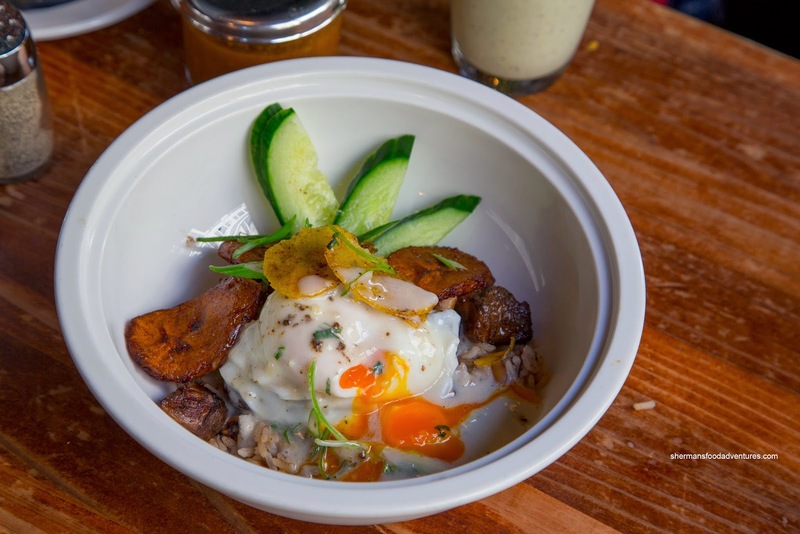 Lastly, we asked to try the Oxtail Brunch Bowl because others raved about it. Since we were pretty full, it was served with only one egg (rather than the regular 2). This concoction consisted of rice and peas, braised ox-tail, fried plantains, poached free-run egg and coconut rundown Hollandaise. The star of the show was definitely the ox-tail as it was moist and meaty with a peppery-clove thing going on. Mixed with the rest of the ingredients, it was a decadent creation. 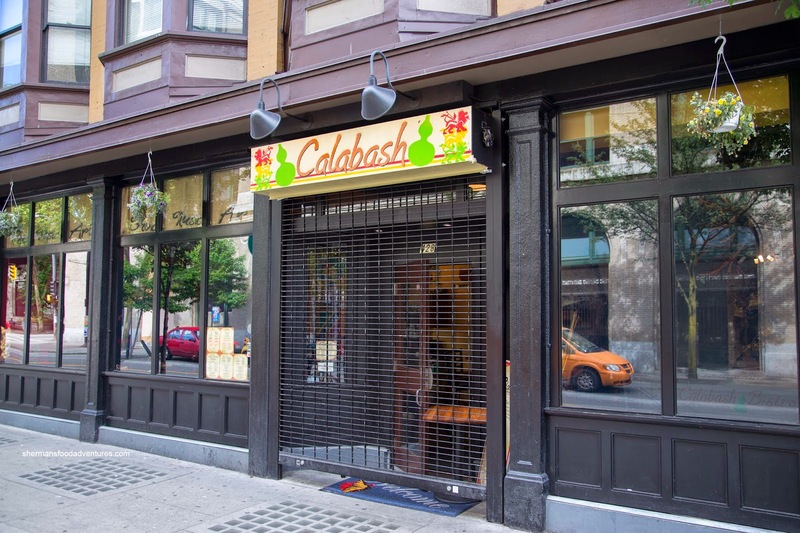 From the items we sampled, it is pretty clear that Calabash offers something different for brunch compared to the regular. For roughly the same price, it is definitely worth trying out.